On a hill of the small village Mravince, near Split is located this wonderful holiday house with pool. It is situated on the ground floor of a family house and consists of two bedrooms, bathroom. A stunning holiday house located on a hill in the small village of Mravince, near Split. With its own pool, this family house consists of two bedrooms, 2 bathrooms, a well equipped kitchen with living room and front terrace. Splendid views of the City of Split can be seen and enjoyed from the covered terrace adjacent to the house. Guests benefit from their own barbecue area and pool area and can enjoy blissful views of the surrounding islands and mountains. The beautful town old town of Split is located about 10 Km away. This beautiful apartment is made from brick or stone and was originally built in 1983 and refurbished in 2014. The agent has rated it as a four star property so it is a well-equipped apartment with above average furnishings. It is also great value for money. 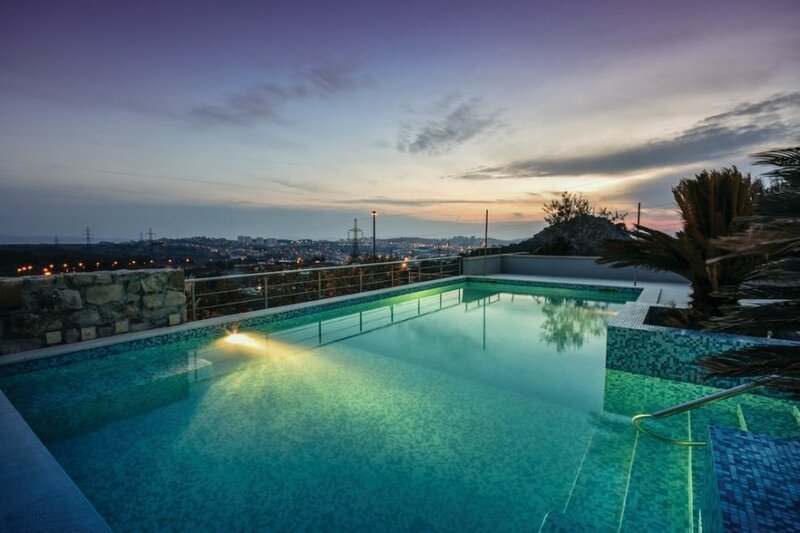 This apartment has a swimming pool and beautiful panoramic view over water; it is also located in Mravince, only 10km from Split. It is set in a good location, 3.5km away from a stone and pebble beach. There's also a restaurant only 150 metres away.